AOS Heating has been one of the industry's leading experts in the Heating & Boiler industry for over 33 years. Established in 1984, AOS are family run business who is proud of the reputation we have accomplished over the years. AOS are a trusted company due to our outstanding customer service record, not only do we provide an honest, reliable service we also offer first class central heating, electrical & plumbing services for all. Whether you need repairs or servicing to an existing heating system or you are interested in a completely new central heating installation we'll make sure you get the best results. What's more AOS are also specialists in the most up-to-date heating advancements, including renewable & green technologies such as the latest energy efficient boilers and air source heat pumps. Whatever the job, you can rest assured that you are in expert hands. Buying any new and expensive new technology can be scary, but AOS clearly understand air source heat pumps inside out. We took about 3 months to arrive at our buy decision and throughout this period AOS answered all our questions patiently and fully. We raised all sorts of questions and AOS organised a visit to the manufacturer which was very helpful. Independently, we visited also our Council and talked to other users. All the AOS personnel have been great. The installation team deserve special mention. They were unfailing polite, clean and considerate of our needs. The installation had been planned well, with everything happened efficiently. We are only a week in post installation, but we are very happy. Credit too to Ofgem RHI, which processed our RHI application within 48 hours. From the first time we contacted the company, their communication has been exemplary. They explained everything and were quick and flexible when we wanted to add items and make changes. We believe the price we paid was very fair, and they helped us to apply successfully and promptly for the domestic RHI. The on-site team were polite, friendly and accommodating. They worked fast, but were neat, considerate and careful, respecting the fabric and contents of our 400-year-old Grade 2* listed farmhouse. The system is working exactly as they said it would, and we are delighted. AOS are a very honest, knowledgeable and hardworking company. I can only speak highly of AOS. Each member of staff took responsibility for my installation. They were able to bring my install date forward by two weeks with no issues at all. The work itself has been done to a very high standard, in a very efficient and tidy fashion. All staff are knowledgeable and willing to resolve queries or answer questions. Happy to recommend. Professional - courteous - efficient - tidy....what more is there to say! From the outset, our experience with AOS has been most positive. 'Air Source Heat Pump' was not a subject we knew much about, but the down to earth explanations soon had us enthusiastic to explore further. Living in an ancient (17th century) cottage with a not quite so ancient oil fired boiler in need of replacement we were in the perfect position to consider this more modern solution. The proposed system stacked up well against the competition. Next step was a detailed survey to confirm that the notional solution fully met the requirements. In our case, replacement radiators were recommended - so some additional expense - but we considered this to be sensible and the deal was done. We then had some additional approvals to work through as we live in a Conservation Area, so we had to delay the AOS-offered installation date by a couple of weeks. The installation team, arrived promptly on the appointed day. They were extremely professional, pleasant and hard working. They worked steadily through the project and were diligent in tidying up each day. Obviously a very disruptive few days for us but we have nothing but praise for their dedication to the job and their tidiness at the end of each day. And the result: a consistently warm house with none of the previous cold corners. The system just gently works away keeping the warmth just right. It has really made a big difference to this home! AOS quoted for installation of an air source heat pump and right from the start they were the quickest to respond, the most professional and helpful. Once the product was agreed, AOS installation team were extremely professional and courteous. The installation was neat and tidy. When I had a query, AOS visited the next day to ensure all was OK. The system works well and is a joy to use. I did a bit of research for a local company and had a number of quotes for an Air Source Heat pump to replace our ageing oil boiler. I was impressed with the presentation that Andy from AOS gave. His explanation of the system was aimed at the lay person. After deciding to use them we were introduced to the office staff, Abbie, Charlotte and Sian, who are courteous and knowledgeable and quick with the relevant information. The site visit performed by Lee was done once again with professionalism and informative. The installation was done on the date agreed and completed on time. we were pleasantly surprised that we were left with hot water for the four days the install took. The install team, Tom, Ryan and Harvey were polite, courteous, tidy and professional. I was impressed with the workmanship. The only teething problem was sorted quickly and was a part supply issue not an AOS issue. An after install visit was performed a week after the system was installed by Jack who answered the few questions we had and did a final check of the system and all appears to be running well and a nice warm home. January was probably not the best time to replace your heating system. I would recommend AOS Energy Efficient Heating Systems Limited wholeheartedly. AOS Energy carried out their work very efficiently. Excellent timekeeping. Clean and tidy. Very polite staff. I have recommend them to my neighbour who has contacted them for a survey as I was so happy with all aspects of their work. We would not hesitate to recommend this Company. They were professional, competent and friendly from the initial survey to the completed job. 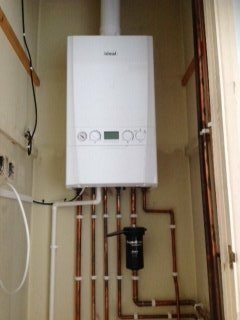 They worked hard to finish the installation of an urgently needed new boiler just before Christmas. We were impressed by the efficient way they made good on any repairs that resulted from this work and we will be taking out their Service Cover and continue to use them. Following a presentation by AOS, much research & early discussions, we had a survey & energy report. Then made the decision to commit to changing from oil to an air source pump. We have been very impressed at every stage of the process. The ‘no pressure ‘ sales, the efficiency and courtesy of the team, who made sure we were happy at each stage. We were particularly impressed with the way they worked with a potential apprentice, carefully explaining techniques/checking his work. The handover explanation was clearly done, with all questions answered. One week in and we are thrilled with our new heating system. Many thanks to all concerned. Air Pump and Central Heating Installation. Not having any mains gas in our village we decided it was time to replace our existing expensive storage radiators. Having attended an AOS presentation on Air Pumps we decided to get a survey and quote for a full system. We are totally satisfied with the outcome. The installation team were punctual, professional, personable and efficient. They always tidied up before leaving at the end of the day, we were never left without hot water and they complemented my wife on her home made "Short Bread". I recommend AOS for reliable and efficient service.